Demography (from prefix demo- from Ancient Greek δῆμος dēmos meaning "the people", and -graphy from γράφω graphō, implies "writing, description or measurement") is the statistical study of populations, especially human beings. As a very general science, it can analyse any kind of dynamic living population, i.e., one that changes over time or space (see population dynamics). Demography encompasses the study of the size, structure, and distribution of these populations, and spatial or temporal changes in them in response to birth, migration, ageing, and death. Based on the demographic research of the earth, earth's population up to the year 2050 and 2100 can be estimated by demographers. Demographics are quantifiable characteristics of a given population. Demographic thoughts can be traced back to antiquity, and were present in many civilizations and cultures, like Ancient Greece, Ancient Rome, India and China. In ancient Greece, this can be found in the writings of Herodotus, Thucidides, Hippocrates, Epicurus, Protagoras, Polus, Plato and Aristotle. In Rome, writers and philosophers like Cicero, Seneca, Pliny the elder, Marcus Aurelius, Epictetus, Cato, and Collumella also expressed important ideas on this ground. There are a variety of demographic methods for modelling population processes. 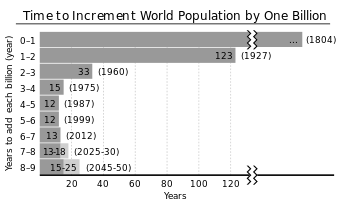 They include models of mortality (including the life table, Gompertz models, hazards models, Cox proportional hazards models, multiple decrement life tables, Brass relational logits), fertility (Hernes model, Coale-Trussell models, parity progression ratios), marriage (Singulate Mean at Marriage, Page model), disability (Sullivan's method, multistate life tables), population projections (Lee Carter, the Leslie Matrix), and population momentum (Keyfitz). Note that the crude death rate as defined above and applied to a whole population can give a misleading impression. For example, the number of deaths per 1,000 people can be higher for developed nations than in less-developed countries, despite standards of health being better in developed countries. This is because developed countries have proportionally more older people, who are more likely to die in a given year, so that the overall mortality rate can be higher even if the mortality rate at any given age is lower. A more complete picture of mortality is given by a life table which summarizes mortality separately at each age. A life table is necessary to give a good estimate of life expectancy. ↑ "The Science of Population". demographicpartitions.org. Retrieved 4 August 2015. ↑ de Gans, Henk and Frans van Poppel (2000) Contributions from the margins. Dutch statisticians, actuaries and medical doctors and the methods of demography in the time of Wilhelm Lexis. Workshop on ‘Lexis in Context: German and Eastern& Northern European Contributions to Demography 1860-1910’ at the Max Planck Institute for Demographic Research, Rostock , August 28 and 29, 2000. ↑ Elliott J and Shepherd P (2006). "Cohort profile: 1970 British Birth Cohort (BCS70)". International Journal of Epidemiology. 35 (4): 846–843. doi:10.1093/ije/dyl174. PMID 16931528. ↑ Lutz, Wolfgang; Sanderson, Warren; Scherbov, Sergei (1997-06-19). "Doubling of world population unlikely" (PDF). Nature. 387 (6635): 803–805. doi:10.1038/42935. PMID 9194559. Retrieved 2008-11-13.